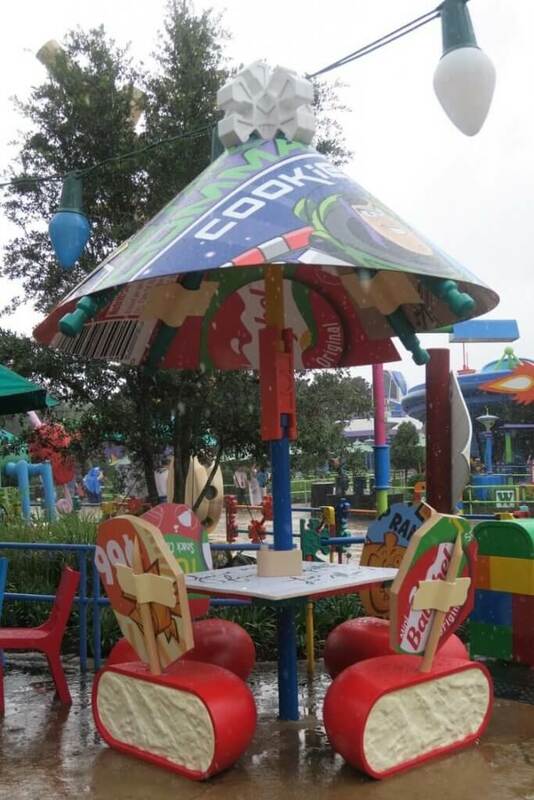 I wrote a few months ago about my experience in Toy Story Land in Hong Kong Disneyland, and how much I was looking forward to one thing above all others, when #ToyStoryLand would finally open in Walt Disney World — the theming. I have raved about the delightful theming of the mini-land in the Asian parks, and was so thrilled when I was invited with TravelingMom and Walt Disney World to check out the opening of the land stateside! I was provided with two nights lodging and early access to the land, but all opinions are my own. 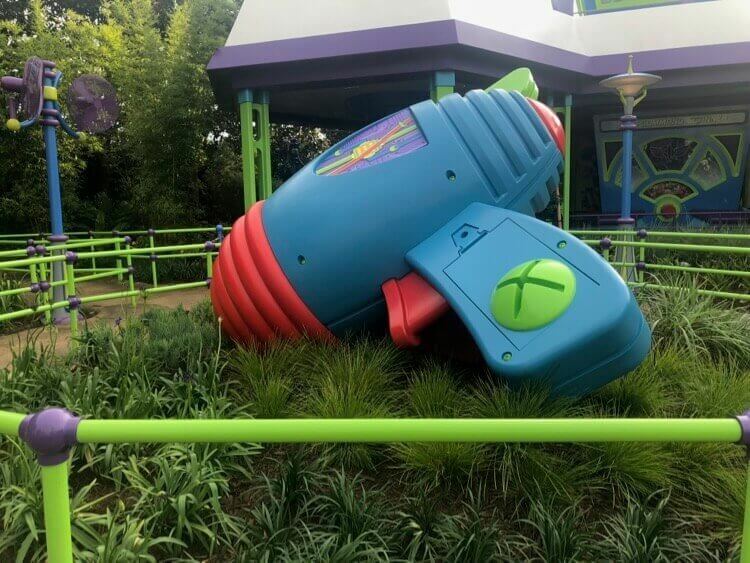 Did the Walt Disney World Toy Story Land theming deliver? I’ll admit – sometimes when changes are announced at Walt Disney World or Disneyland, I get a little anxious. I don’t do well with change! That said, my hesitation never lasts long because I remember example after example where the Disney Imagineers have made changes and done them so well; I trust them and their vision for these parks. In the case of Toy Story Land, I wasn’t even a little bit hesitant. Having seen the mini land in Hong Kong (which opened 7 years earlier) and the Toy Story Hotel in Shanghai (opened in 2016), I couldn’t wait to see the details the imagineers would bring to life in Disney’s Hollywood Studios. 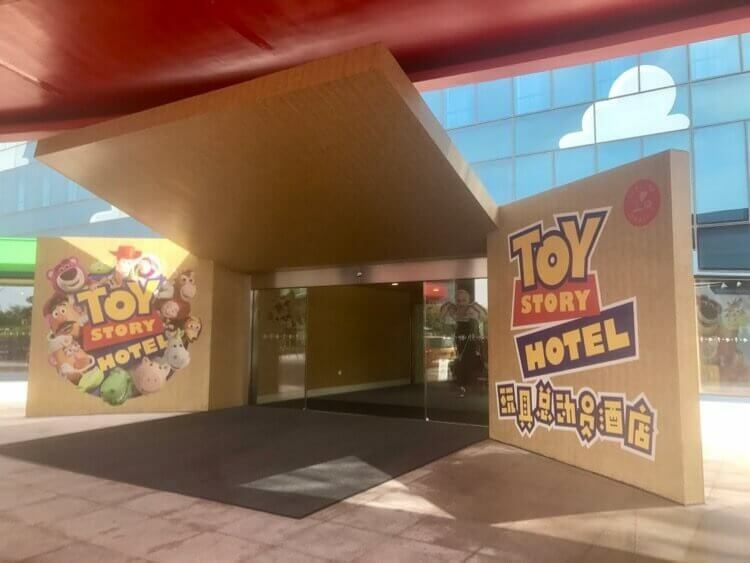 The details and immersion of the Shanghai Disneyland Toy Story Hotel made me realize it was all going to be delightful when Toy Story Land opened in Disney’s Hollywood Studios! 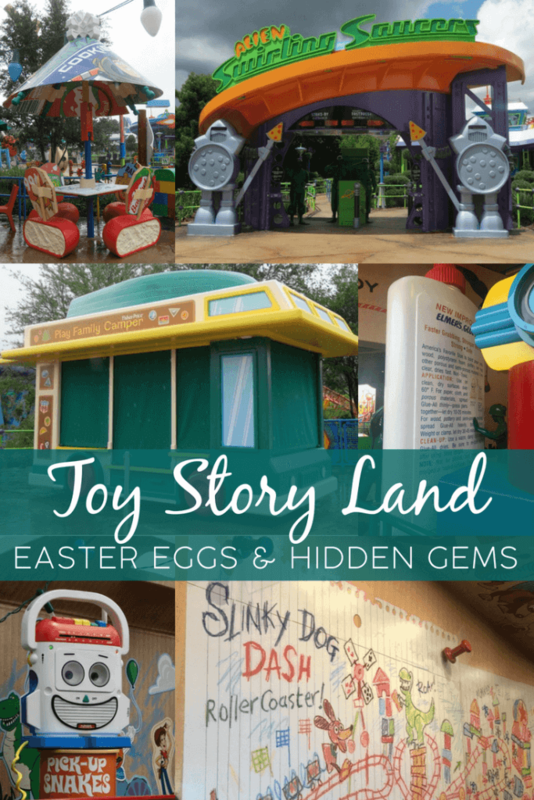 From the moment we stepped foot into Florida’s Toy Story Land, it felt familiar – and perhaps even more playful. When you visit this land, you’ll find the same kinds of theming: Tinker Toy lampposts, domino benches, Scrabble tile signs, and the like – and you will immediately get the feeling that you are the size of a toy, wandering around Andy’s backyard. 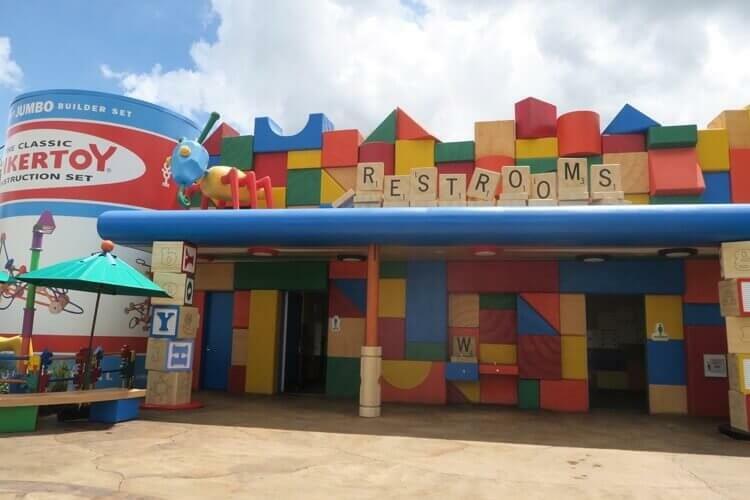 Scrabble tile signs, blocks, and so many more toys make up the theming of Toy Story Land – and make us so delightfully nostalgic! 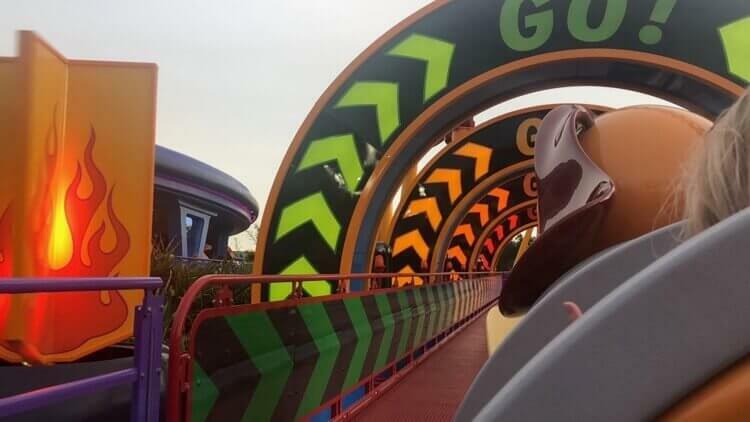 So if I’m writing my second piece on Toy Story Land and have yet to even mention the two new attractions, Slinky Dog Dash and Alien Swirling Saucers – both fantastic, by the way – you know that I truly fell in love with the details. The “Toy Carts” in Toy Story Land are just that. Toy Carts. 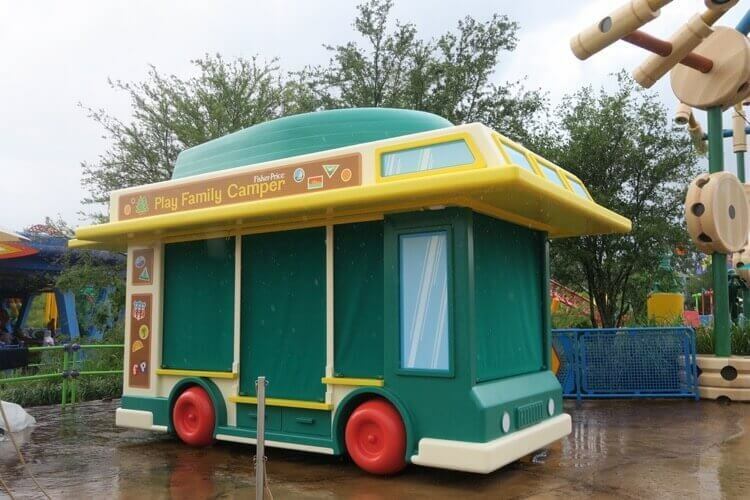 Look for this Fisher Price Family Camper and a toy dump truck in the land! You’ve done these things before, and your kids probably still get a kick out of them — Run through the slightly wet grass, then onto the sidewalk or driveway to compare shoe prints. Walk in the literal footprints of your friends and family to see how your feet compare. We barely noticed Andy’s shoe prints in Hong Kong Disneyland, until we had stepped over them a few times. Imagineers have made them stand out in the latest Toy Story Land! 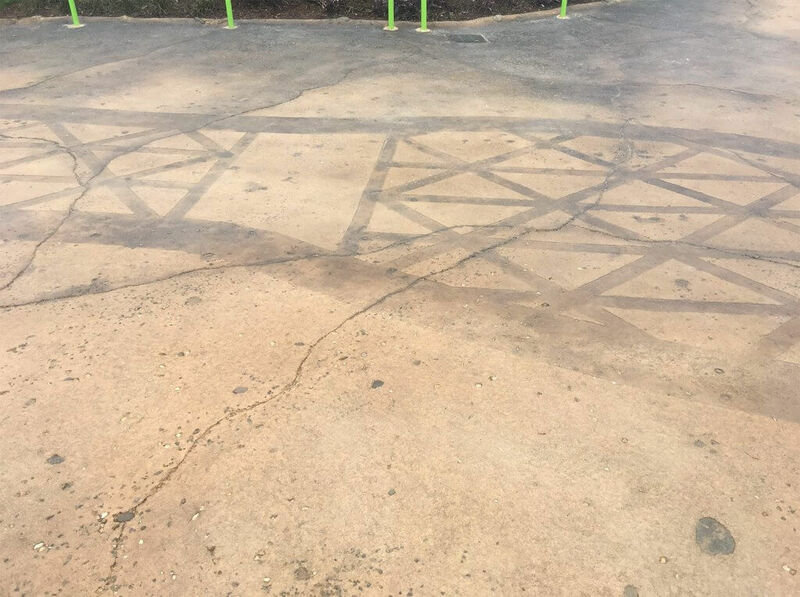 In Toy Story Land, you can walk in the footprints of the kid whose yard you’re now playing in. But remember: Andy is a boy, and you. are. a. toy. (Or at least the size of a toy!) When we were in Hong Kong, we walked over these giant footprints a few times before we even noticed them! Rex — the most feared dinosaur? Well, he tries anyway! Check out the Al’s Toy Barn price tag, too. I love the details in Toy Story Land! If you’ve seen the Toy Story movies, and I’m assuming you have, you know Rex. He’s the lovable dinosaur that wants nothing more than to be scary… but at best manages almost scaring Woody once or twice. 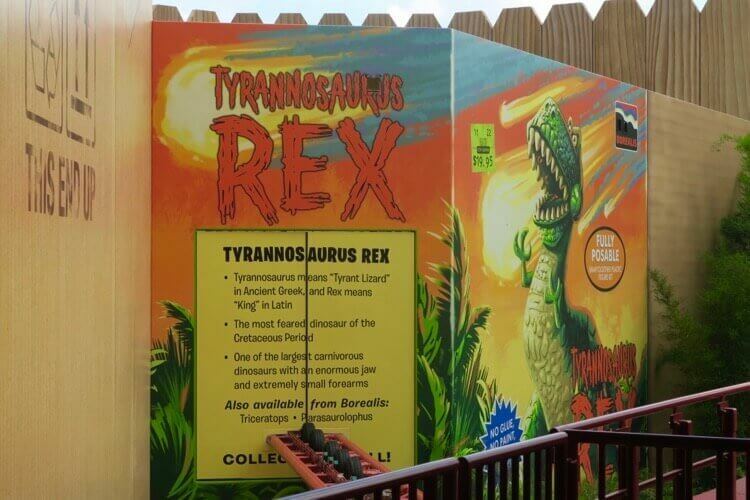 That’s why I loved seeing Rex’s box, touting him as the “most feared dinosaur of the Cretaceous Period”. Oh, poor Rex. We love you, anyway! In the first movie, we see giant suits of armor guarding the entrance to the Pizza Planet arcade and restaurant. They were based on something called Cyclons from Battlestar Galactica, and I literally never thought of them again, until yesterday; when I saw them outside Alien Swirling Saucers, I immediately remembered them. What a fun detail, right?! They look so cool standing watch over the entrance, helping make sure nobody sneaks into the Fastpass lane until their proper time. I had a chance to speak briefly with one of the cast members about merchandising, and I can’t wait to share that interview with you. Until then though, suffice it to say that the developers had a great time creating merchandise and toys themed to, well, toys! This part in Slinky Dog Dash is of particular inspiration to the design of one of the toys kids (and kids at heart!) can take home from #ToyStoryLand! 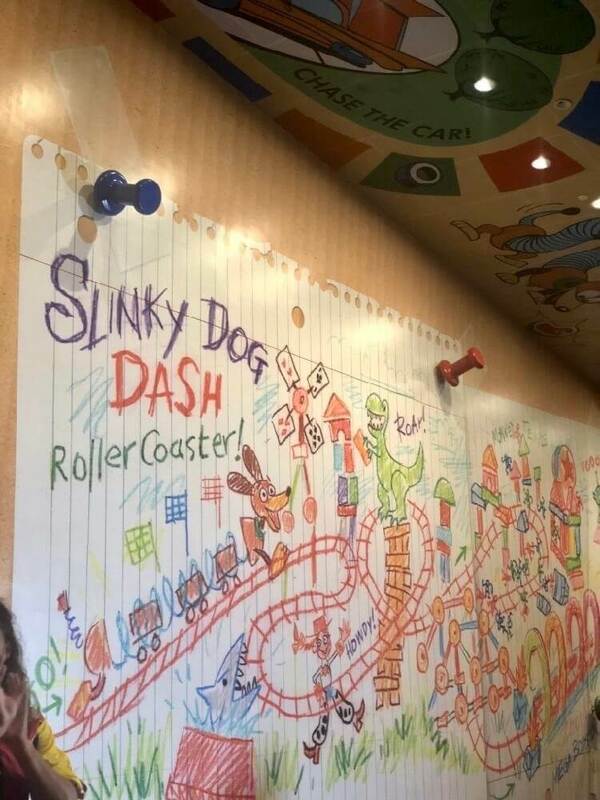 The person who worked on my favorite toy finally got to ride Slinky Dog Dash, and see his creation replicated in one part of the ride. How fun is that?! So this isn’t technically all that hidden, considering it’s gigantic. But don’t miss details like this that make super fun photo ops! 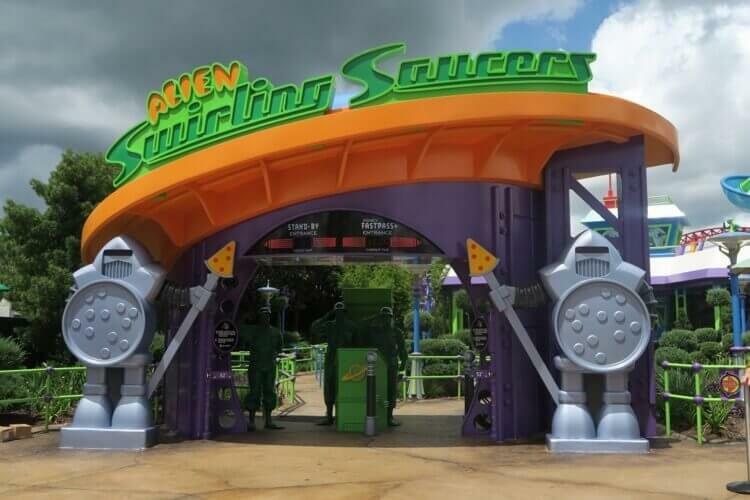 A blaster from your favorite Buzz Lightyear ride is one of MANY great photo ops in Toy Story Land! And this one is totally not an easter egg, per se. But if Baby Care Centers are my favorite “hidden gem” in Disney Parks, this one is worth noting, too: each of the attraction queues has drinking fountains. The land is hot, especially in the summer, so I absolutely love that they added these to keep people hydrated. Don’t forget to fill up your water bottles, wet down your cooling towels, or take a long, cold drink as you pass! 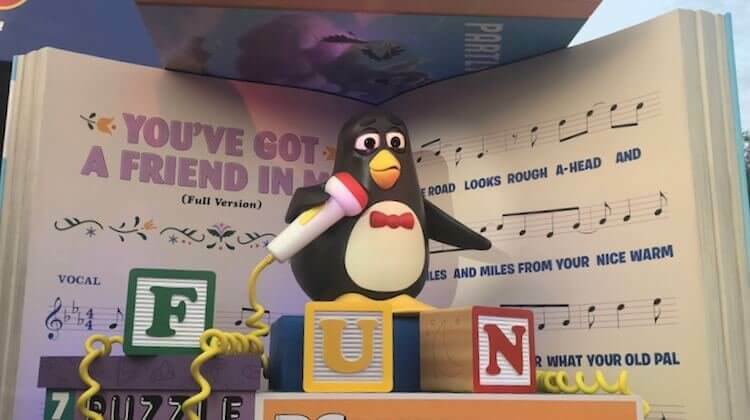 In Toy Story 2, we’re treated to Wheezy’s repaired voice as he croons “You’ve Got a Friend in Me”. After riding Slinky Dog Dash, you’re invited to a sing-along with Wheezy! It’s a lot of fun… and if your timing is right, you might even catch a smidge of leftover squeak. Wheezy may be embarrassed if we pointed that out, but I think it’s pretty endearing. Sing along with Wheezy at the end of Slinky Dog Dash! You may even catch a sweet little leftover squeak! Clear tape and push pins hold Andy’s plans and signs to boxes. Andy holds up his plans with tape and pushpins – such a cute detail! We see magnets (or stickers?) from Andy’s travels…. and of course, from Pizza Planet. 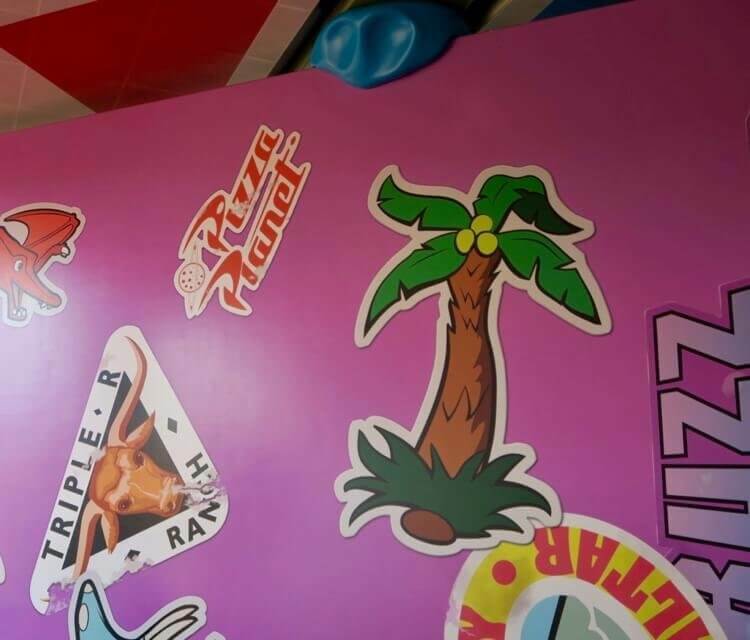 Are these magnets or stickers from Andy’s favorite destinations? Of course he’d include Pizza Planet! Tables and chairs are made from leftover food and wrappers. As a parent of three kids who collect literal trash at times “to make something with it”, this made me smile from ear to ear. So maybe it’s ok that my kids keep trash to “make things” out of it…. ? You’re going to adore playing big in Toy Story Land, which officially opened today (June 30, 2018). But make sure you truly play like a kid, and enjoy the little things while you’re there! CHECK IT OUT NOW, AND PIN FOR LATER!